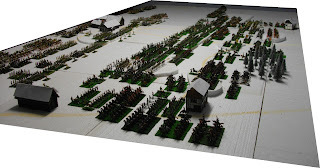 • 1 008 infantry figures, 324 cavalry figures and 11 model guns and crews for the French, • 936 infantry figures, 396 cavalry figures and 19 model guns and crews for the Russians, plus • 144 infantry figures, 36 cavalry figures and 1 model gun and crew for the Prussians, although not all of these were present on the table at once. It was several months in the planning and we were pleased with the resulting game although, as the French player, I was not so happy with the outcome! Photo 1: The opposing armies line up for battle on a grey February day. Photo 2: View from ‘Benningsen’s’ command post. 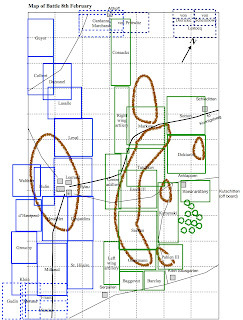 Figure 1: Map of the tabletop showing the initial dispositions of the French (blue) and Russian (green) armies. The squares are 300 x 300 mm2, ground scale 1 mm equals 2 m.
The battle began at 08:00 (Photos 1 and 2) with interesting manoeuvrings by both sides (Photo 3 and 4). ‘Napoleon’ launched an audacious attack in which three divisions of the reserve cavalry, d’Hautpoul’s cuirassiers and the dragoons of Grouchy and Klein, ten regiments in all, were sent to the left to join the light cavalry in a massive attack on the Russian right flank. This movement was supported by a pinning attack from St Hilaire’s division (IV Corps) against the Russian left and a heavy bombardment of the Russian centre by the guns of the Guard artillery plus those of IV Corps (Soult), with support from VII Corps’ guns (Augereau). Simultaneously, on the Russian left, Baggovut’s and Barclay de Tolly’s divisions turned to their left with the intention of moving to the south-east to extend the Russian left flank beyond Serpallen. This meant that the left wing grand battery and Ostermann-Tolstoi’s division were the sole Russian troops facing the French attack from St Hilaire. Photo 3 and 4: Opening manoeuvres: Russian left flank and St Hilaire’s attack. Photo 5: French light cavalry preparing to drive-off Platov’s Cossacks and open the way for the reserve cavalry. 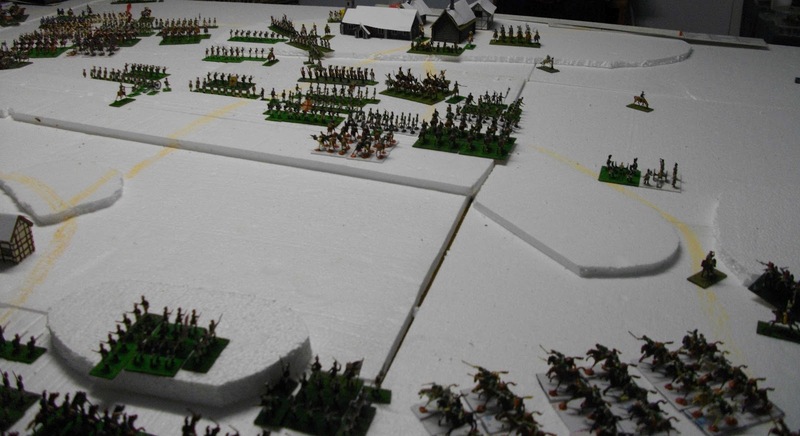 Photo 6: Lasalle’s 5th Hussars dispatch the Ingermanland Dragoons. From the beginning the French attack produced mixed results. Lasalle’s 5th Hussars entered a mêlée with some of Markov’s dragoons and won, sending them in flight to the rear (Photo 5 and 6). At first the French were ecstatic, thinking that they had overcome the “mighty” Moscow Dragoons of Golymin fame. Their jubilation was tempered somewhat when it was realised that it was the Ingermanland Dragoons that had been overcome so easily. This became a stark realisation when the 11th Chasseurs, also part of Lasalle’s brigade, were charged in flank by the “mighty” Moscow Dragoons and broken (Photo 7)! Photo 7: Counter-attack—the “mighty” Moscow Dragoons again! 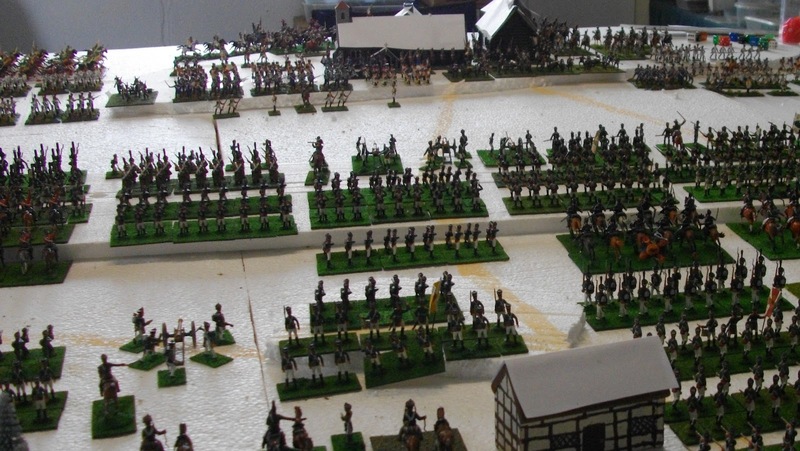 One hour into the battle and each army's manoeuvrings continued. In anticipation of success on his left (north-west flank), ‘Napoleon’ launched the divisions of Leval and Legrand (IV Corps) to attack the Russian centre. 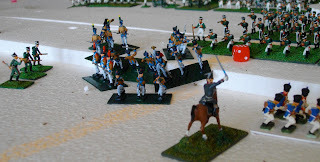 Best laid plans are often set to go astray and things turned from bad to worse for the French light cavalry. Guyot’s brigade of the 8th Hussars and 16th & 22nd Chasseurs à Cheval crashed into Platov’s Cossacks, expecting an easy victory. Their confidence and pride were shattered as the Cossacks won the mêlée and sent them back to where they had come (Photo 8). The 5th Hussars suffered a similar fate when, rallying after their previous success against the Ingermanland Dragoons, they charged into the left-hand regiments of the Cossacks and were beaten in turn. Photo 8: Cossacks! The expected easy victory over Platov’s Cossacks was not to be. Success for the French is this sector of the battlefield came from some unexpected sources. 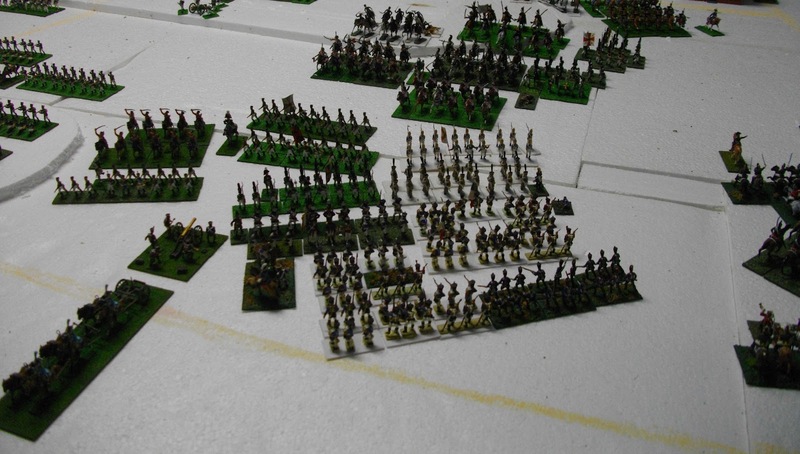 Markov’s Lithuanian Uhlans charged the lead unit of Leval’s division, 1/4e ligne, which formed square and easily beat them off (Photos 9 and 10). The Ingermanland Dragoons added to their earlier disgrace by continuing to retreat and were not seen for the remainder of the battle. Lasalle's appeal to his remaining unit, the 7th Hussars, was successful and they remained despite the loss of the other two regiments of his ‘infernal brigade’. Photo 9 and 10: Lithuanian Uhlans were beaten off by the square of 1/4e ligne. The French were faring better in the south-eastern sector of the battlefield. St Hilaire's infantry overran the Russian left wing grand battery which had inflicted few casualties as they approached (Photo 11). It was not all one-way traffic though as the horse artillery of Ostermann-Tolstoi’s 2nd Division repelled an attack by the 1/55e ligne and then the 10e légère, both also from St Hilaire’s division. Photo 11: Success and failure—St Hilaire’s infantry advance rapidly to assault Russian batteries. It was now mid-morning. Throughout the three hours of battle thus far the artillery of both sides had bombarded their opponents' centre but, while the Russian gunners struggled with range and accuracy, the French were in pleine forme. This effective artillery fire continued over the next two hours, breaking some infantry in the Russian centre. Aided by the artillery bombardment Legrand and Leval's divisions attacked the Russian centre-right (Photo 12), making good progress, with the former over-running the Russian central grand battery. Photo 12: Attack of Legrand’s and Leval’s divisions on Russian centre-right. 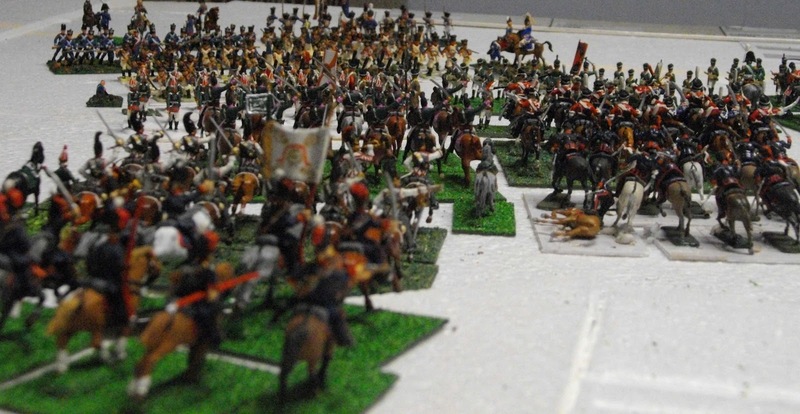 On the left, the French light cavalry fought more mêlées against Platov’s Cossacks, a little more successfully this time. Two units of Cossacks were broken, but Durosnel's 7th Chasseurs were also beaten. This last set-back was compounded by other developments. Lasalle's division n'existe plus as the 7th Hussars were broken by artillery fire, while, by contrast, Markov's reserve cavalry remained, demoralised, but still present. 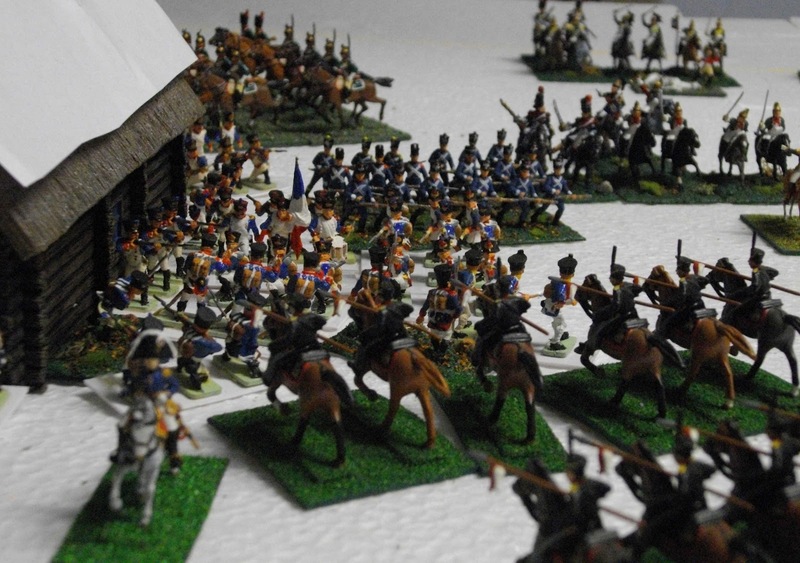 While these combats were occurring, ‘Napoleon’ launched Augereau's corps at the Russian centre-left. He had thus committed all his available troops bar the Imperial Guard and Milhaud’s strong dragoon division. This was a calculated risk. Help was on the way in the form of the lead troops of Davout’s corps, Friant's division, which entered the southern corner of the battlefield. At this stage the French had the upper hand; or so it seemed. By midday the French light cavalry, which had struggled against the Platov's Cossacks and Markov's reserve cavalry, were finally gaining the ascendency. Additionally, they now had 'serious' support in the form of the three French heavy cavalry divisions that were readying to launch a charge against their weaker opponents (Photo 13). Photo 13: Dashing through the snow... Murat at the head of the column of reserve cavalry just prior to its entry into combat on the Russian left flank. The initial attack by d'Hautpoul's 1st Cuirassiers against the Petersburg Dragoons was not successful and they fell back and rallied with small loss. Platov's Cossacks were finally driven off by the last of Guyot’s, Colbert’s and Durosnel’s cavalry (Photo 14) and when Tutchkov’s division retreated due to the cumulative effects of the French bombardment a huge gap opened in the Russian right-centre (Photo 15). This gap looked ominous, but Leval and Legrand's attacks had faltered (Photo 16) so there were no French troops available to take advantage of it. Oh for those heavy cavalry! Photo 14: Beaten but not broken. Platov’s Cossacks in retreat after putting up a spirited defence that saw them break several units of chasseurs and hussars, embarrassing many a beau sabreur and severely disrupting the attack on the Russian right wing. Photo 15: Gap in Russian line left by retreat of Tutchkov’s division (centre top of photo), but where were the French troops to exploit it? Photo 16: Faltering attack: Legrand’s troops in retreat—under the very nose of the Emperor! Photos 17 to 20: Snowstorm! With the snow blowing directly at them, the French units made some erratic movements on their left flank, centre and right flank (top to bottom). ‘Benningsen’ took the opportunity to launch timely and well-executed counter-attacks, sending four divisions against the thin French line in front of Eylau and on the French right (Photos 21 to 25). Sacken’s grenadiers charged and broke the 14e and 44e ligne of Desjardin’s division (VII Corps), demoralising it in the process. Further attacks from the Russian legions further exposed the thin French line as first Desjardin’s division (VII Corps), then Heudelet’s (VII Corps), followed by Legrand (IV Corps) all broke or ceased to be effective fighting forces. At the same time the attack by Friant's division was blunted by Baggovut’s 4th Jägers. Photos 21 to 25: Russian counter-attacks break units of Desjardin’s (Photo 21), Legrand’s (Photos 22 & 23), Leval’s (Photo 24) and St Hilaire's (Photo 25) divisions. The Russians drove on. Essen III’s division pushed towards Eylau while Sacken, Ostermann-Tolsoi, Baggovut and Barclay de Tolly's divisions attacked Davout's three divisions. The only success for the French came on the left flank where d'Hautpoul's 10th/11th Cuirassiers easily accounted for the Pavlograd Hussars (Photos 26 and 27), thus causing Markov's reserve cavalry division to break. 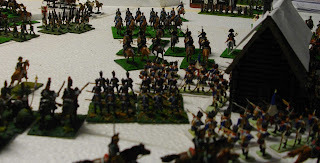 Photos 26 and 27: d'Hautpoul's 10th/11th Cuirassiers break the Pavlograd Hussars. At 16:00 it seemed that the French were doomed (Photo 28). 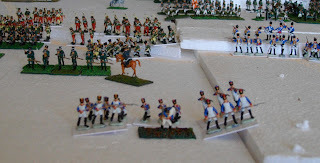 Napoleon himself was under threat from Essen III's troops and Davout looked set to be overwhelmed (Photo 29). Added to this L'Estocq's Prussians had arrived behind Klein Sausgarten. Photo 28: Battlefield at around 16:00. Photo 29: Crisis in the French centre as Essen III’s troops drive towards Eylau. The situation worsened for the French over the next two hours of battle. In an attempt to stem the advance of the Russians, Milhaud sent his 5th Dragoons against Sacken’s Tauride Grenadiers, but they were pushed back. Worse still, his 12th and 8th Dragoons lost mêlées against the Leibguard Cuirassiers and Kargopol Dragoons of Ostermann's division and were forced to retreat (Photos 30 and 31). Photo 30 and 31: Milhaud’s 12th and 8th Dragoons beaten in mêlées against the Leibguard Cuirassiers and Kargopol Dragoons, but not broken. Around Serpallen, Friant's 33e ligne charged and broke the 4th Jägers, but then they and the 48e ligne failed to form square and were overrun by the Alexandria Hussars from Baggovut’s division (Photo 32). This was too much for Friant's men who ceased to be an effective fighting force, leaving the defence of the French right to Davout's two other, fresh divisions; Morand and Gudin. Photo 32: 33e & 48e ligne overrun by the Alexandria Hussars. 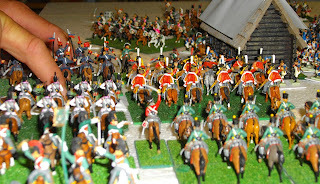 The only success for the French in this period was provided in dramatic style by the reserve cavalry. In the biggest cavalry mélêe of the battle so far, the lead units of the three heavy cavalry divisions charged and broke three units of Russian cavalry (Finland Dragoons, Mitau Dragoons, Grodno Hussars) from Somov’s division (Photo 33). This was to be the ‘high tide’ of the Russian counter-attack as this French success seemed to be the trigger for another twist to this great struggle (Photo 34). 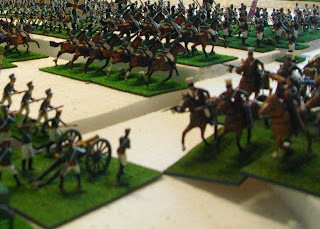 Photo 33: Classic Napoleonic wargaming: the clash of steel. Photo 34: The "high-tide" of the Russian counter-attack. Around Eylau, the Imperial Guard firstly repelled and then counter-attacked against Essen III's men. The 1st Chasseurs à Pied broke three battalions of Russian grenadiers and musketeers (Moscow Grenadiers, Vyborg Musketeers, Schlisselburg Musketeers) over four hours of fighting. North-west of Serpallen, Milhaud's fresh 16th and 9th/21st Dragoons charged and broke Ostermann-Tolstoi’s Leibguard Cuirassiers and Isoum Hussars (Photo 35). 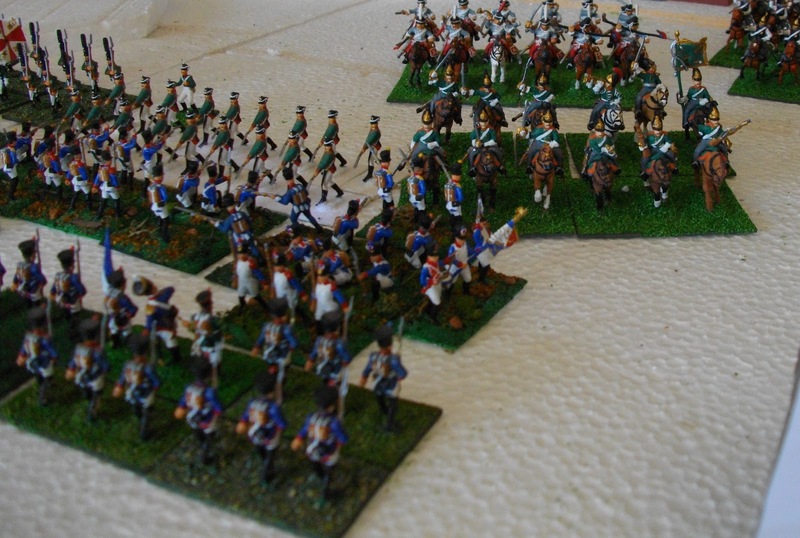 Photo 35: Milhaud’s 16th and 9th/21st Dragoons stand firm having broken Leibguard Cuirassiers and Isoum Hussars. Further north and the 57e ligne was broken by artillery fire, causing Leval's division to break (Photo 36). This was balanced by Sumov's division which failed divisional morale and retreated. Ney arrived with his corps at the north-west of the battlefield and immediately sent Gardanne's division to attack the Prussian rearguard around Althoff (Photo 37). Photo 36: Gap on the French left flank caused by the loss of Leval’s division. 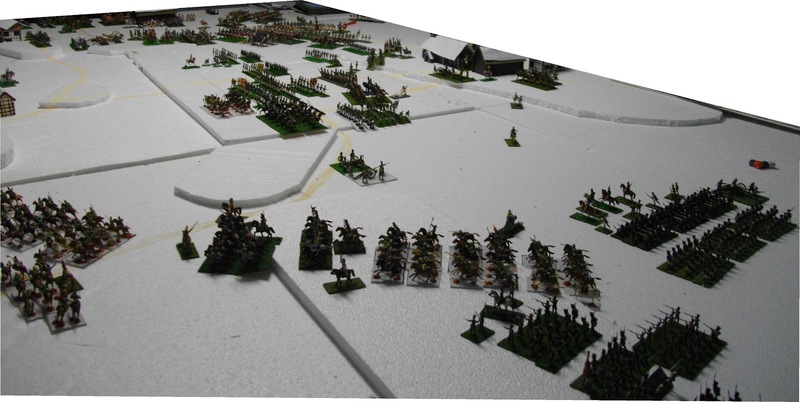 The battlefield was engulfed by the long northern twilight. Success continued to favour the French arms by dint of targeted counter-attacks by good quality troops and, of course, a bit of “lady luck”. Milhaud's 16th Dragoons broke the Pskov Dragoons of Barclay de Tolly’s 3rd Brigade of the 4th Division (Photo 38). The Polish Uhlans of the same formation were then broken by fire from Gudin’s divisional artillery (Photo 39). 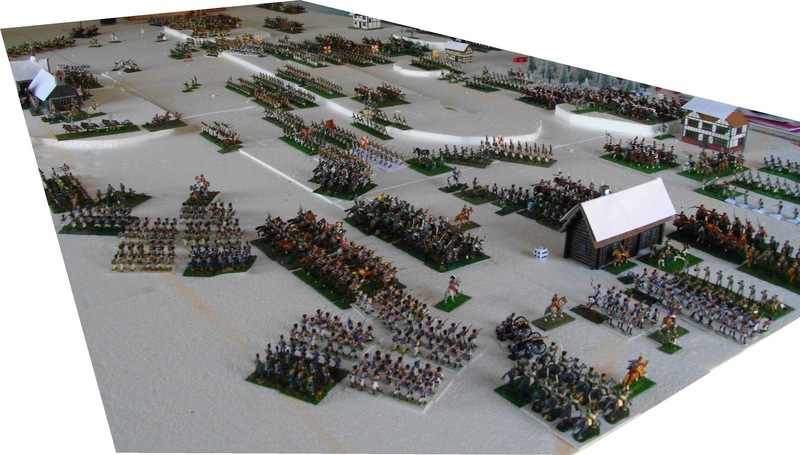 Photo 38: Milhaud’s 16th Dragoons, supported by the 9th/21st Dragoons prepare to charge the Pskov Dragoons (right of photo). Photo 39: The “hand of god” removes the Polish Uhlans, victims of French artillery fire. 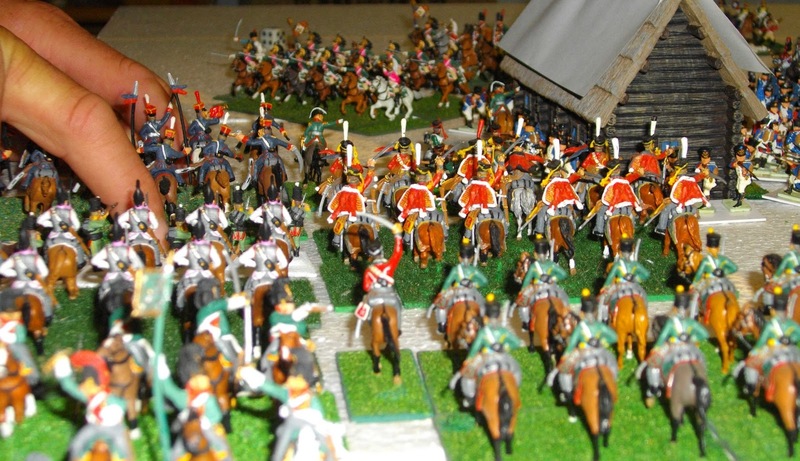 The remainder of Barclay de Tolly’s cavalry are in the foreground, while Milhaud’s dragoons are in readiness at the top of the picture. The Guard continued its successful defence around Eylau, breaking all of the Russian units that attacked their position or were attacked by them (Photos 40 to 42). As the toll mounted, Essen III's division became demoralised, but was never quite broken. In an attempt to emulate their eponymous foot-slogging cousins, the Chasseurs à Cheval unsuccessfully charged the square of Dokhtorov’s Tenginski Musketeers, but rallied back on the left of Eylau, behind the Grenadiers à Cheval (Photo 43). Photos 40 to 42: In defense of the Emperor, the 1st Chasseurs à Pied and 1st and 2nd Grenadiers à Pied beat off all attacks and counter-attack Essen III’s troops. 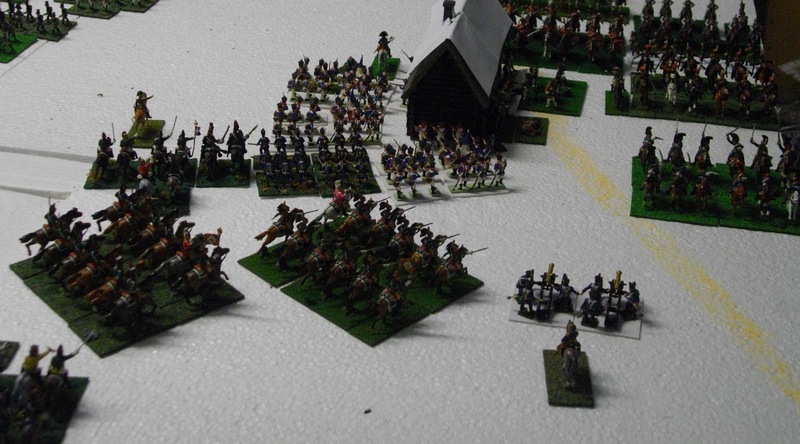 Photos 43: The Chasseurs à Cheval retreat in disgrace having failed to dislodge the square of the Tenginski Musketeers. 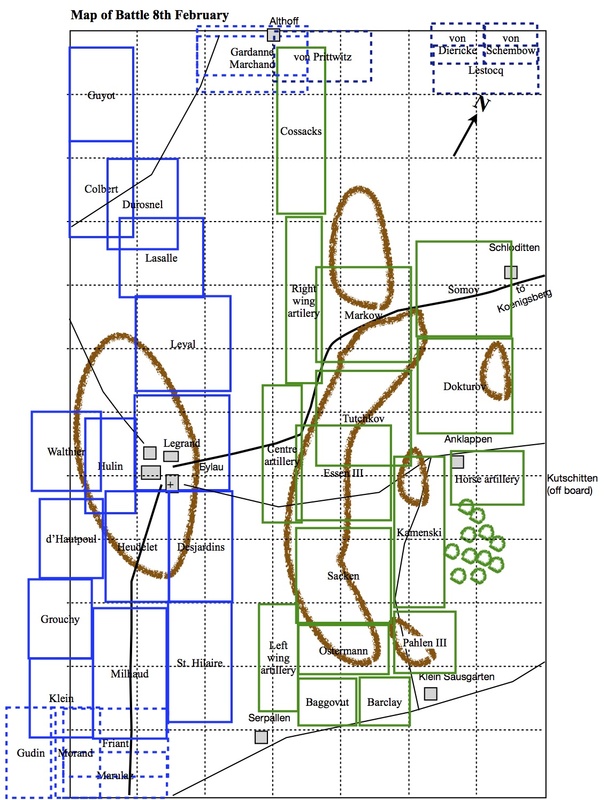 At the south-eastern end of the battlefield the fight around Serpallen continued. L’Estoq’s Towarzycs Uhlans broke the square of the 1/21e ligne of Gudin's division, but were in turn broken due to a successful (and lucky) defence by the 2/21e ligne that had failed to form square (Photos 44 and 45)! On their left, Morand’s division (III Corps) defended grimly against the attacks of Sacken’s infantry supported by Count Pahlen III’s cavalry (Photos 46 and 47). Photos 44 and 45: Towarzycs Uhlans broke the square of the 1/21e ligne of Gudin's division (above) only to be broken themselves after a successful defence by the 2/21e ligne (below). 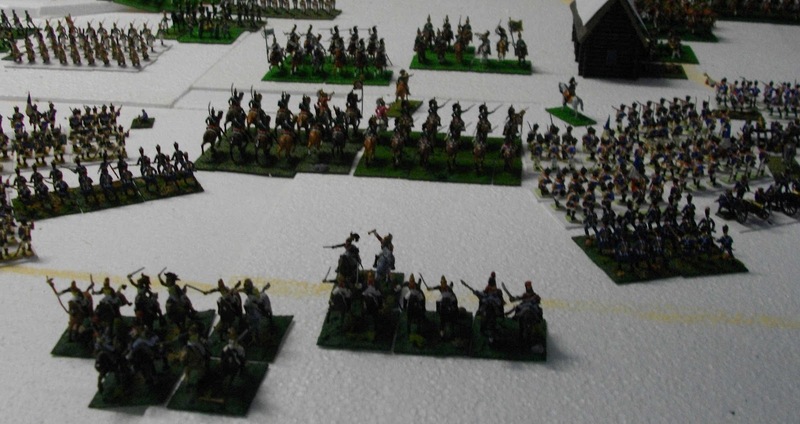 Photos 46 and 47: Above: Morand’s division defend against attacks of Sacken’s infantry supported by Pahlen III’s cavalry. 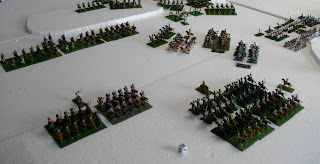 Below: the view from the Russian side (Pahlen III’s cavalry). These aforementioned troops of III Corps formed a solid line on the French right flank, ably supported by the crucial, successful charges from Milhaud's dragoons. On the Russian right, Somov's division which had been further mauled by the French reserve cavalry, failed morale and broke, leaving the French heavy horsemen free to attack the weakened Russian right flank (Photo 48). 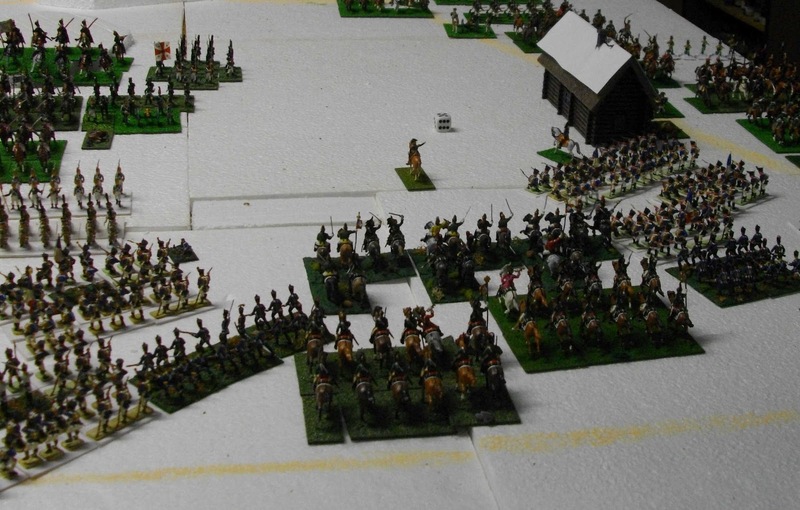 Photo 48: A lone aide rushes across what was the Russian right flank with new orders for the reserve cavalry. 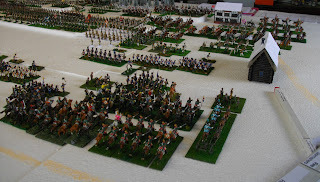 The French reserve cavalry are at the far left, with Somov’s retreating division in the centre-rear. The final actions of the day had the potential to affect the outcome, but in the end changed little. An attack by the 1st Grenadiers à Pied was stopped by a volley of musket fire from Essen III’s Archangelsk Musketeers; a defence that prevented a test of divisional morale and probably saved the division. Dokhtorov’s Ekaterinoslav Grenadiers were not so fortunate when attacked and broken by a combined attack of the Grenadiers à Cheval and 1st Chasseurs à Pied. Lastly, in the failing light, d'Hautpoul's cuirassiers charged and broke Tutchkov's artillery battery. So, as twilight transformed to night, the battle ended. Ney's corps had joined the reserve cavalry in establishing French control of the north-west area of the battlefield (Russian right flank), and the situation in the centre and right seemed to have been stabilised by the performance of the Guard, III Corps and Milhaud's dragoons (Photos 49 to 51). This was an illusion and the 'wash-up' told a different story. 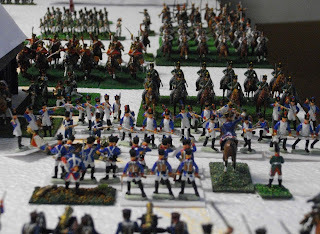 Photos 49 to 51: End of battle from (top to bottom) the north-west, centre and south-east. French losses were eight divisions broken or 'destroyed' (five infantry divisions and three (small) light cavalry divisions) while the Russians had lost only four divisions (Tutchkov's and Somov's 'infantry' divisions, the Cossacks and Markov's cavalry), plus most of their artillery, with another 'infantry' division (Dokhturov) in retreat and under threat from the French cavalry reserve. Tellingly, the French army had lost 145 points of MR against an army break point of 172, so was only two broken divisions away from its break point—although the divisions remaining on the field were all relatively strong. The battle was therefore a Russian 'smashing victory'. The Emperor was most displeased! With hindsight the audacious flank attack by three-quarters of the reserve cavalry was never going to succeed. This movement deprived the French of a powerful ‘battering ram’ that would have been so useful when the gap opened in the Russian centre. For his part, ‘Benningsen’ timed his counter-attacks to perfection and conducted them brilliantly. These attacks may have been even more successful, had it not been for the dogged defence by the Guard, III Corps and Milhaud’s dragoons and some important pieces of luck. 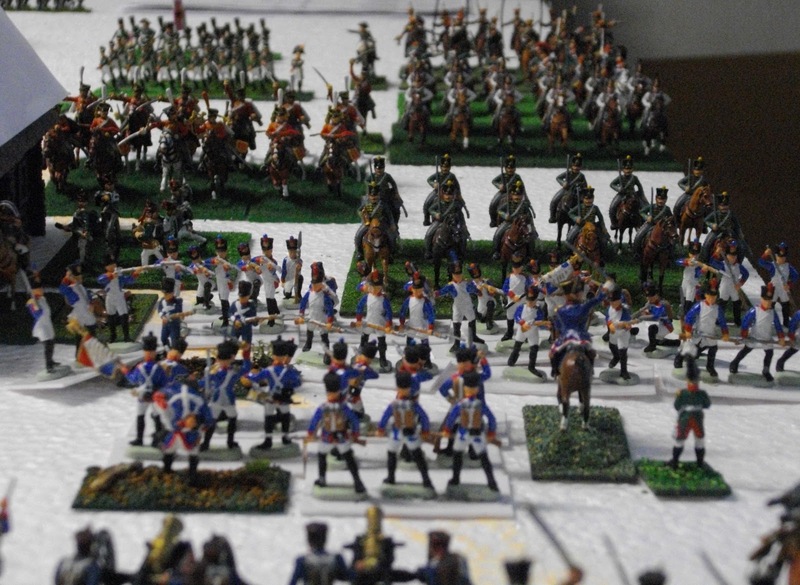 As with the real thing, this battle was a preparation for the intense struggle of Borodino. Unlike the real thing we knew it and have planned it as such! Wow! a real tour de force, James! A real meat-grinder, by the sound of it. I love the 'snowy' terrain! How long did it take to play? Yeah, it was a classic French vs Russian slog and, except for the outflanking attempt, much like the real thing. We set-up on the afternoon-evening of one weekend and then played the game over two days of a later weekend, in our usual steady fashion with time for discussion, photos, note-taking and sustenance! 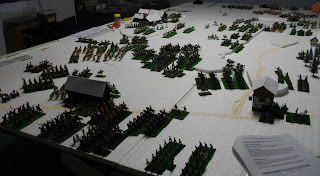 We even had a guest player for most of Day Two in the person of Steve from the Napoleonic Wargaming Society in Perth. I was really pleased with the foam sheets as 'snow'; worked even better than we had envisaged. The simple 'snow-covered' rooves worked too (just don't look too closely). 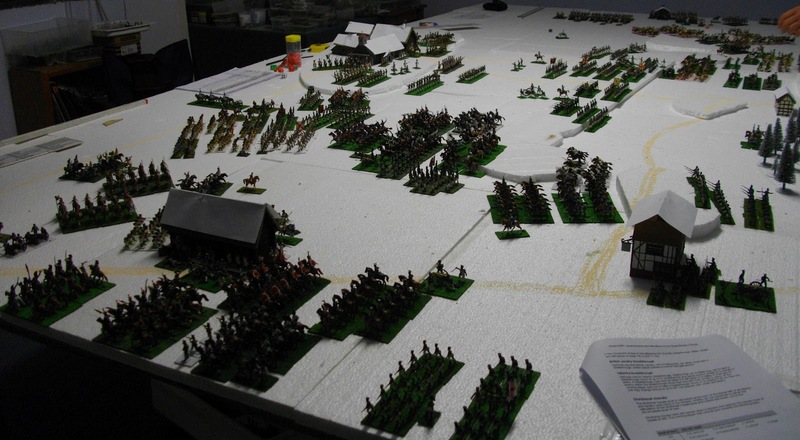 Your snow covered terrain is VERY convincing. The battle sounds like it was a good one with lots close melees and plenty for all commanders to do. I am envious of the time you have available for a game! Our "long" battles last @8 hours! Thanks James. We have a sizeable game every month and have the 'good fortune' of a dedicated place that can be left set-up, if necessary. 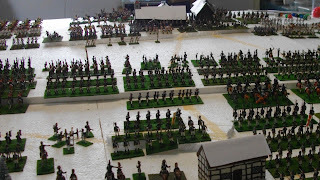 I consider myself very fortunate to have met up with two other blokes with the same wargaming interests and approach to the hobby in an area with a population of ~4 000!